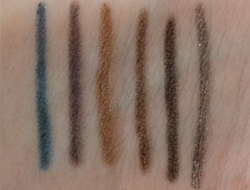 This diverse set of eye pencils allows you to do a variety of eye looks without necessarily using a black eyeliner, but still maintaining that dark smoky look. One of my favourite things about this product, and Urban Decay items in general, is the packaging. Each pencil is stored in its own place within the neat black box, that accentuates the unique colour of each pencil. 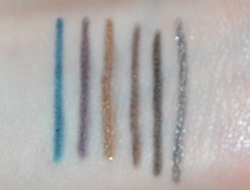 The eye pencil colours included are (As pictured left to right) Uzi, Zero, Demolition, Smog, Empire, and Mainline. Each pencil is versatile, meaning that you don’t only have to use these with a smoky look. Very smooth application, it glides along the skin. It’s not completely opaque, but can easily be if you apply more pressure or layer it. The pigmentation is good both on the waterline and the outer eye. It’s easy to achieve a fine line. It is a little difficult to get them out of their packaging, but if you press down on the lid they should pop out. 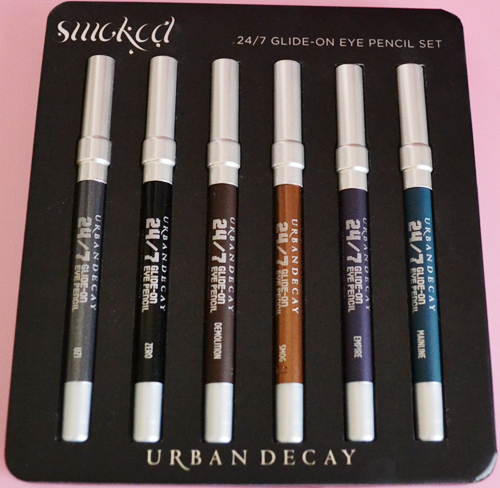 Urban Decay is amazing, I love this set too!